Georgia will play for college football’s national championship next Monday after making the greatest comeback in Rose Bowl Game history. 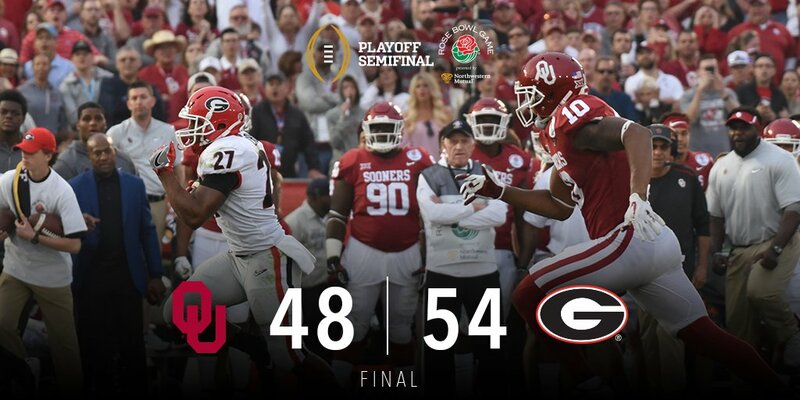 The Bulldogs overcame a 17-point deficit late in the first half to defeat Oklahoma, 54-48, in double overtime in the College Football Playoff Semifinal at the Rose Bowl Monday. The victory puts Georgia (13-1) into Monday’s national championship game in Atlanta against Alabama, a 24-6 winner over Clemson, in the other semifinal, the Sugar Bowl, played later Monday in New Orleans. “We didn’t play the way we were capable of, but the best news is we get a chance to play again,” Bulldogs coach Kirby Smart said. This was the first Rose Bowl Game that went into overtime. College football added overtime in 1996. Each team is guaranteed a possession. Additional overtime periods are played if the score is tied at the end of overtime. Sony Michel took a direct snap and ran 27 yards for the winning touchdown in the second overtime before a crowd announced at 92,844. Lorenzo Carter blocked a 27-yard field goal attempt by Austin Seibert on the first possession of the second overtime. Georgia’s Rodrigo Blankenship kicked a 38-yard field goal on the opening possession of the first overtime. Seibert responded with a 33-yard field goal for Oklahoma. The Bulldogs sent the game into overtime on Nick Chubb’s 2-yard touchdown run with 55 seconds left in regulation. The Sooners had taken a 45-38 lead with 6:52 remaining on strong safety Steven Parker’s 46-yard fumble return for a touchdown. Michel ran for 181 yards and three touchdowns on 11 carries, caught a 13-yard pass from Jake Fromm in the first quarter for Georgia’s first points and was selected as the offensive player of the game. Michel set the Rose Bowl Game record for highest average per carry with a minimum 10 carries, 16.5 yards. The previous record was 15.7 yards by Michigan’s Tyrone Wheatley in the 1993 game. Bulldogs linebacker Roquan Smith made a game-high 11 tackles and was selected as the defensive player of the game. Georgia trailed 31-14 with six seconds left in the second quarter. The previous largest deficit overcome in the Rose Bowl Game was 15 points by USC in its 52-49 victory over Penn State in the 2017 game. The Trojans trailed 42-25 in the third quarter. 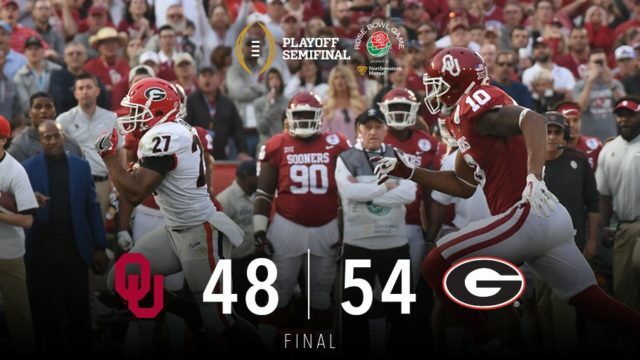 The comeback began when Blankenship kicked a Rose Bowl-record 55-yard field goal as time expired in the first half, cutting the Sooners lead to 31- 17. The previous record was 52 yards, set by Rich Spangler of Ohio State in 1985 and tied a year later by Rob Houghtlin of Iowa. Only two teams in the previous 103 Rose Bowl Games had overcome a double-digit deficit at halftime — Alabama in 1926 and Michigan in 1989. The Bulldogs scored the first 21 points of the second half to take their first lead, 38-31. Chubb and Michel ran for 50- and 38-yard touchdowns in the third quarter and Fromm threw a 4-yard touchdown pass to Javon Wims with 13:57 left in the fourth quarter. Oklahoma retied the score on Heisman Trophy winning quarterback Baker Mayfield’s 11-yard touchdown pass to Flowers with 8:47 to play. The game was the highest-scoring Rose Bowl, one point more than the 101 points scored in the 2017 game. 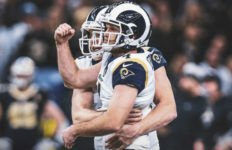 Mayfield completed 23 of 35 passes for 287 yards and two touchdowns and had one pass intercepted. Mayfield also caught a pass for a third score and Rodney Anderson ran for two touchdowns for the Sooners (12-2). Chubb ran for 145 yards and two touchdowns. Fromm completed 20 of 29 passes for 210 yards and two touchdowns. Oklahoma outgained the Bulldogs, 531 yards to 527, and led 24-21 in first downs and 32:58-27:02 in time of possession. The Sooners scored touchdowns on each of their first three possessions. Oklahoma opened the scoring 3:29 into the game on a 13-yard pass from Mayfield to Marquise Brown, who played at College of the Canyons in Santa Clarita in 2016. Anderson ran for 9- and 41-yard touchdowns on the Sooners’ next two possessions. Seibert kicked a 38-yard field goal the next time Oklahoma had the ball. The play that ended with Mayfield catching a 2-yard touchdown pass from CeeDee Lamb six seconds before halftime began with Mayfield pitching the ball to Flowers, a fullback, who ran left, then handed the ball to Lamb who ran right, then threw a jump pass to Mayfield. It was the first time a quarterback had caught a touchdown pass in the Rose Bowl Game since USC’s Matt Leinhart in 2004. The Rose Bowl Game dispenses with its traditional Big Ten versus Pac- 12 matchup once every three years to serve as a College Football Playoff Semifinal. The matchup was determined by the final College Football Playoff rankings, which are made by a 13-member committee of five former coaches, four athletic directors, two former administrators, a college president and a former sports reporter. Oklahoma, the Big 12 Conference champion, was second in the final rankings, one spot ahead of Southeastern Conference champion Georgia. Atlantic Coast Conference champion Clemson was ranked first and Alabama fourth.